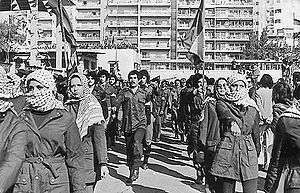 Fedayeen from Fatah at a rally in Beirut, 1979. PLO ousted from Lebanon in the 1982 Lebanon War, relocated to Tunis. The Palestinian insurgency in South Lebanon was a conflict initiated by Palestinian militants based in South Lebanon upon Israel since 1968, which evolved into the wider Lebanese Civil War in 1975 and lasted until the expulsion of the Palestinian Liberation Organization from Lebanon in the 1982 Lebanon War. Though the PFLP and some other Palestinian factions continued a low-level military activities against Israel from Lebanese soil, after 1982, the conflict is considered to have shifted from Palestinian-Israeli to Israel-Hezbollah conflict. The South Lebanon insurgency, which peaked through the 1970s, claimed hundreds of Israeli and Palestinian military and civilian lives, and is considered among the key elements to starting the Lebanese Civil War. From 1968 onwards, the Palestine Liberation Organization (PLO) began conducting raids from Lebanon into Israel, and Israel began making retaliatory raids into Lebanon and encourage the Lebanese people to themselves deal with the fedayeen. After an Israeli airline was machine-gunned by Palestinian militants at Athens Airport, Israel bombed the Beirut International Airport in retaliation, destroying 13 civilian aircraft. On 8 May 1970, a PLO faction called the Democratic Front for the Liberation of Palestine (DFLP) crossed into Israel and carried out the Avivim school bus massacre. With headquarters moved to Beirut, PLO factions recruited new members from the Palestinian refugee camps. South Lebanon was nicknamed "Fatahland" due to the predominance there of Yasser Arafat's Fatah organization. With its own army operating freely in Lebanon, the PLO had created a state within a state. By 1975, more than 300,000 Palestinian displaced persons lived in Lebanon. Aside being used as an operation base for raids on Israel and against Israeli institutions across the world, the PLO and other Palestinian militant organizations also began a series of airplane hijack operations, targeting Israeli and international flights, carrying Israelis and Jews. The more profound effect on Lebanon was destabilization and increasing sectarian strife, which would eventually deteriorate into a full-blown civil war. The Popular Front for the Liberation of Palestine - General Command, which split from the PLO in 1974, carried out the Kiryat Shmona massacre in April of that year. In May 1974, the DFLP crossed again into Israel and carried out the Ma'alot massacre. 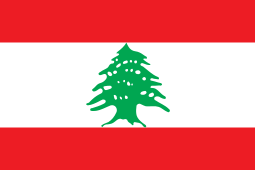 The Lebanese Civil War (1975–1990) was a complex conflict in the form of various factions and shifting alliances between and among Lebanese Maronite Catholics, Lebanese Muslims, Palestinians, Lebanese Druze, and other non-sectarian groups. Governmental power had been allotted among the different religious groups by the National Pact based partially on the results of the 1932 census. Changes in demographics and increased feelings of deprivation by certain ethnic groups, as well as Israeli-Palestinian clashes in the south of the county all contributed to the outbreak of the Lebanese Civil War. Fearing loss of commercial access to the port of Beirut, in June 1976 Syria intervened in the civil war to support the Maronite dominated government, and by October had 40,000 troops stationed within Lebanon. 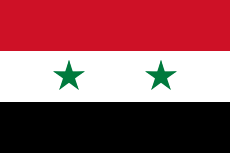 The following year, however, Syria switched sides and began supporting the Palestinians. On 11 March 1978, eleven PLO militants made a sea landing in Haifa, Israel, where they hijacked a bus, full of people, killing those on board in what is known as the Coastal Road massacre. By the end of the day, nine hijackers and 37 Israeli civilians were killed. In response, on 14 March 1978, Israel launched Operation Litani occupying southern Lebanon, except for the city of Tyre, with 25,000 troops. The objective was to push the PLO away from the border and bolster a Lebanese Christian militia allied with Israel, the South Lebanese Army (SLA). On 22 April 1979, Samir Kuntar and three other members of the Palestine Liberation Front, a sometimes faction of the PLO, landed in Nahariya, Israel from Tyre, Lebanon by boat. After killing a police officer, who had discovered their presence, they took a father and his daughter hostage in an apartment building. After fleeing with the hostages from police back to the beach, a shootout killed one policeman and two of the militants. Kuntar then executed the hostages before he and the remaining invader were captured. In April 1981, the United States tried to broker a cease-fire in southern Lebanon among Israel, Syria and the PLO. In July 1981, Israel responded to PLO rocket attacks on northern Israeli settlements by bombing PLO encampments in southern Lebanon. United States envoy Philip Habib eventually negotiated a shaky cease-fire that was monitored by UNIFIL. The 1982 Lebanon war began on 6 June 1982, when Israel invaded again in direct retaliation over the assassination attempt by ANO (Abu Nidal's organization, a splinter group from Fatah) on Shlomo Argov, the Israeli ambassador to the UK, attacking Palestinian military bases and refugee camps affiliated with Palestine Liberation Organization and other Palestinian military movements, including the ANO. During the conflict, over 17,000 Lebanese were killed, and the Israeli army laid siege to Beirut. During the war, fighting also occurred between Israel and Syria. The United States, fearing a widening conflict and the prestige the siege was giving PLO leader Yasser Arafat, got all sides to agree to a cease-fire and terms for the PLO's withdrawal on 12 August. The predominantly Muslim Multinational Force in Lebanon arrived to keep the peace and ensure PLO withdrawal. Arafat retreated from Beirut on 30 August 1982 and settled in Tunisia. The 1982 Israeli invasion resulted in the Palestine Liberation Organization's (PLO) departure from Lebanon to Tunisia. The creation of Security Zone in South Lebanon has benefited civilian Israeli population as Galilee suffered lesser violent attacks (dozens civilians killed), than previously by PLO in the 1970s (hundreds of Israeli civilian casualties). Despite this Israeli success in eradicating PLO bases and partial withdraw in 1985, the Israeli invasion had actually increased the severity of conflict with local Lebanese militias and resulted in the consolidation of several local Shia Muslim movements in Lebanon, including Hezbollah and Amal, from a previously unorganized guerrilla movement in the south. Over the years, military casualties of both sides grew higher, as both parties used more modern weaponry, and Hezbollah progressed in its tactics. By the early 1990s, Hezbollah, with support from Syria and Iran, emerged as the leading group and military power, monopolizing the directorship of the guerrilla activity in South Lebanon. The relocation of PLO bases to Tunisia resulted in deterioration of the Israeli-Tunisian ties, which had previously considered relatively tolerant. 1 2 Fisk, Robert (2002). "3". Pity the Nation: The Abduction of Lebanon. New York: Thunder's Mouth Press / Nation's Books. p. 74. ISBN 1-56025-442-4. ↑ Humphreys, Andrew; Lara Dunston; Terry Carter (2004). Lonely Planet Syria & Lebanon (Paperback). Footscray, Victoria: Lonely Planet Publications. p. 31. ISBN 1-86450-333-5. 1 2 3 Peetet, Julie M. (December 1997). "Lebanon: Palestinian refugees in the post-war period". Le Monde diplomatique. Retrieved 1 October 2006. ↑ "Black September in Jordan 1970-1971". Armed Conflict Events Database. 2000-12-16. Retrieved 15 September 2006. ↑ Eisenberg, Laura Zittrain (Fall 2000). "Do Good Fences Make Good Neighbors? 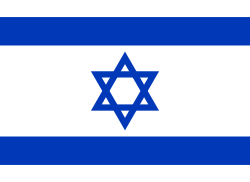 : Israel and Lebanon After the Withdrawal" (PDF). Middle East Review of International Affairs. Retrieved 1 October 2006. ↑ Nisan, Mordechi (2003). 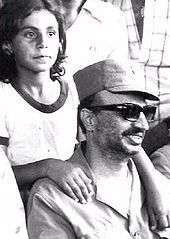 The Conscience of Lebanon: A Political Biography of Ettiene Sakr (Abu-Arz). London, Portland, Oregon: Frank Cass. p. 20. ISBN 0-7146-5392-6. ↑ "Refugees and internally displaced persons". Lebanon. The CIA World Factbook. 2006-08-08. Retrieved 16 August 2006. ↑ "Palestine Liberation Organization (PLO)". Jewish Virtual Library. Retrieved 20 October 2006. ↑ Smith, Charles D. (2001). Palestine and the Arab Israeli Conflict (paperback). Boston: Bedford/St. Martin's. p. 354. ISBN 0-312-20828-6. ↑ Kjeilen, Tore. "Lebanese Civil War". Encyclopaedia of the Orient. Retrieved 14 September 2006. ↑ Bureau of Near Eastern Affairs (October 2005). "Background Note: Syria". U.S. Department of State. Retrieved 15 September 2006. 1 2 3 Federal Research Division (June 2004). Lebanon: A Country Study. Kessinger Publisher. p. 214. ISBN 1-4191-2943-0. ↑ Deeb, Marius (July 2003). Syria's Terrorist War on Lebanon and the Peace Process. Palgrave McMillian. p. 39. ISBN 1-4039-6248-0. ↑ Rubenberg, Cheryl A. (February 1989). "5". Israel and the American National Interest: A Critical Examination (Paperback). University of Illinois Press. p. 227. ISBN 0252060741. ↑ Helen Chapin Metz, ed. (1988). "Israel in Lebanon". Israel: A Country Study. Washington: GPO for the Library of Congress,. ↑ "Timeline: Lebanon". BBC News. 2006-06-15. Retrieved 15 September 2006.